How well can we measure muscle properties with ultrasound? Home » Human muscles fascicles: what can ultrasound and diffusion tensor imaging reveal? Following a stroke or spinal cord injury some people develop stiff joints, sometimes referred to as contracture. It is not well understood why contractures develop. Also, it is not clear whether they result from changes in the muscle or the tendon, which is why researchers and clinicians are very interested in the mechanical properties of these tissues. The length and the orientation of muscle fibers (also referred to as muscle architecture) are important factors that determine the mechanical properties of muscle. Experimentally, ultrasound is often used to visualize and measure the architecture of a muscle. An ultrasound probe is typically placed on the skin overlying a muscle and an image or video of the muscle fibers is captured. These images are two-dimensional (2D), while the muscle has a 3D geometry. Therefore, to get good measurements with ultrasound it is important to hold the probe in the correct orientation relative to the fascicles. Unfortunately, the true orientation of the fascicles is unknown and good alignment of the probe is hard to achieve. During an experiment, it is unclear how well ultrasonographers aligns the probe in the plane of muscle fascicles and what measurement errors might result from a misalignment. In our study, we estimated the accurateness of 2D measurements of muscle architecture by comparing them to 3D reconstructions of the same muscle from magnetic resonance imaging (MRI). We used a special type of MRI scan, called diffusion tensor imaging or DTI, to reconstruct the 3D shape and orientation of the muscle. We made computer models of the medial gastrocnemius muscle, one of the calf muscles that is key to our ability as humans to balance upright and walk. The medial gastrocnemius is also a muscle that is known to be stiffer in patients with ankle contracture after spinal cord injury and can limit their ability to stand or walk. Fascicle length measurements from 2D images sometimes underestimated and sometimes overestimated true 3D length, but these differences were typically small (3mm on average). However, the absolute difference between the two measurements was substantial, almost 10mm or 20% of the fascicle length. The good news: ultrasound measurements of fascicle lengths are unbiased (no systematic error). The bad news: these measures are not very precise. We also found that pennation angle, the orientation of muscle fibres with respect to the tendon they insert on, was underestimated by 6° when measured from ultrasound images. This underestimation was due to a change in muscle shape caused by pressing the ultrasound probe on the skin, which is often necessary to obtain good images of the muscle. 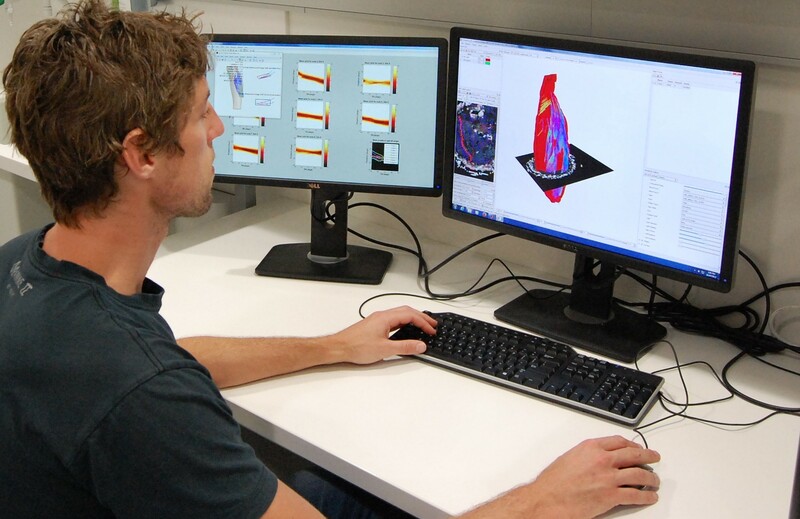 Researcher Bart Bolsterlee working on three-dimensional reconstructions of muscles from diffusion tensor images in one of NeuRA’s labs. This is the first study to report a direct validation of ultrasound measurements of muscle architecture in alive humans. Based on our findings we can better estimate the error in mechanical properties of muscles derived from ultrasound measurements. It is important to know how good (or bad) these measurements are because they are often used by researchers to determine the function or dysfunction of muscles or joints. An equally important outcome of the present study was the development of a technique to make full 3D reconstructions of muscle tissue from MRI and DTI scans. To our knowledge, this has never been done before with such detail. We are currently improving these methods and are working on new applications. We hope to report more about this in the near future, so stay tuned! Bolsterlee B, Veeger HEJ, van der Helm FCT, Gandevia SC, Herbert RD (2015). Comparison of measurements of medial gastrocnemius architectural parameters from ultrasound and diffusion tensor images. J Biomech, in press. Diong JHL, Herbert RD, Harvey LA, Kwah LK, Clarke JL, Hoang PD, Martin JH, Clarke EC, Bilston LE, Gandevia SC (2012). Passive mechanical properties of the gastrocnemius after spinal cord injury. Muscle Nerve 46, 237-245. Kwah, L.K., Pinto, R.Z., Diong, J., Herbert, R.D., 2013. Reliability and validity of ultrasound measurements of muscle fascicle length and pennation in humans: a systematic review. J Appl Physiol 114, 761-769.